Yesterday’s dinner featured two unusual ingredients: grey mullet and wild asparagus. I served them as simple as possible, dressed only with extra virgin olive oil, freshly squeezed lemon juice, sea salt, and freshly ground black pepper. It was delicious and ready in less than half an hour. Grey mullet (not to be confused with red mullet) is also known as goatfish or simply mullet (harder in Dutch, mulet in French, cefalo in Italian). It is a coastal fish with a flattened head. It tastes (when hot smoked) like a leaner more delicate cousin of mackerel. 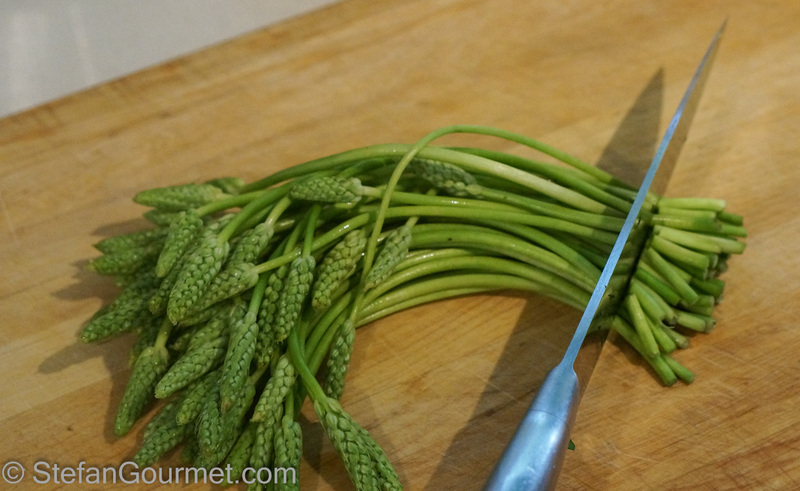 Wild asparagus are not in fact related to asparagus, but they do taste like them. They were brought to my attention by Stéphane of My French Heaven. They actually look like wheat, and are called korenaar asperge (wheat asparagus) in Dutch. Other names for them are Bath asparagus or Prussian asparagus. They have a very nice taste, a bit stronger and ‘greener’ than normal asparagus. 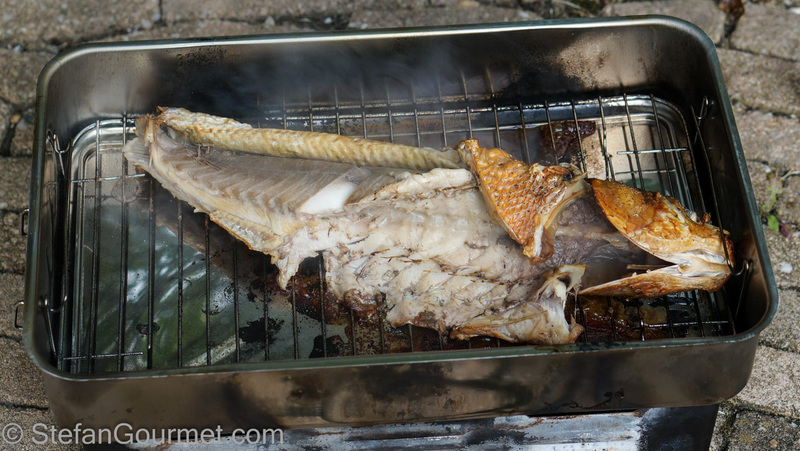 I had heard that grey mullet is often hot smoked in the Netherlands, but I had never tried it and was curious to do so. It turned out to be very tasty indeed. 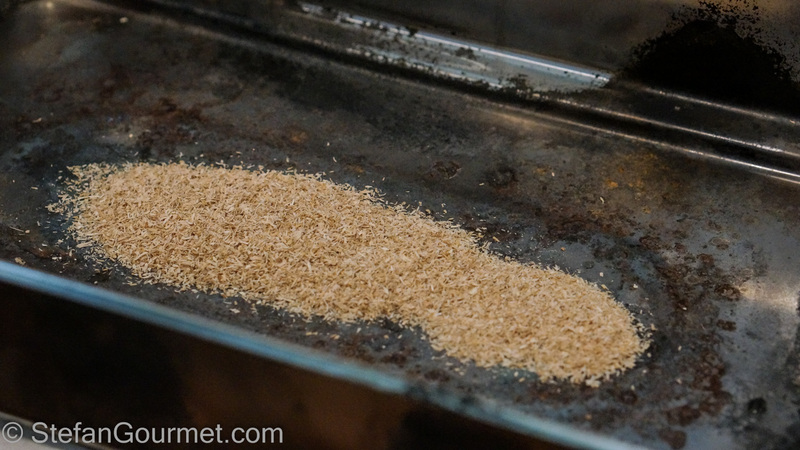 I put 2 tablespoons of beech smoking dust in my stovetop smoker. I rinsed and dried the grey mullet (which had already been gutted by the fishmonger). I cut off the tail and fins and seasoned it with salt and freshly ground black pepper. Cutting of the tail was needed to make it fit in the smoker; the fins would only curl up and burn. …and hot smoked it for 20 minutes. 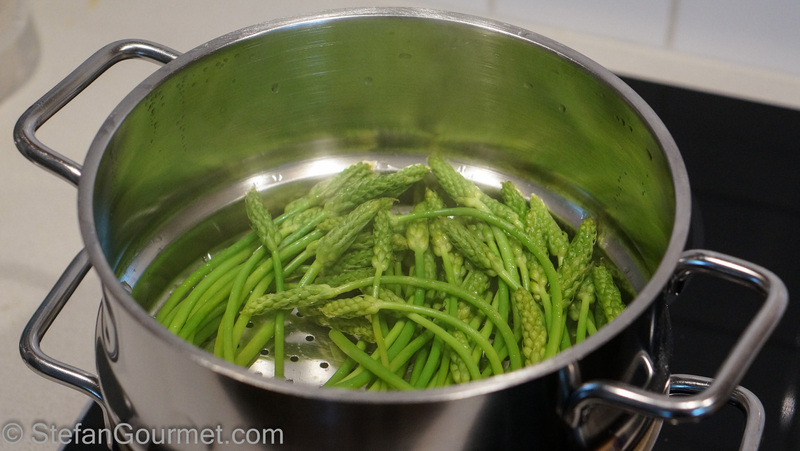 Meanwhile, I washed the wild asparagus and cut off the bottom 2 cm (1 inch). They kept their color very nicely. After 20 minutes the grey mullet was cooked. The skin had split open and the fish could easily be lifted off the bones. 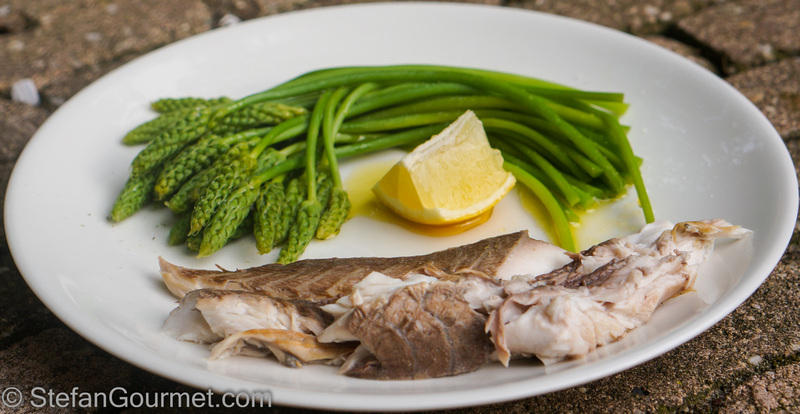 I served the grey mullet and wild asparagus drizzled with olive oil, lemon juice, salt, and freshly ground black pepper. A very simple and tasty secondo piatto (after we had this pasta as primo piatto). Smoked fish and oaked white wine go together well. We enjoyed this with a white Burgundy, a St. Aubin Premier Cru to be more precise, and the vegetal notes of the white Bourgogne went very well with the wild asparagus as well. 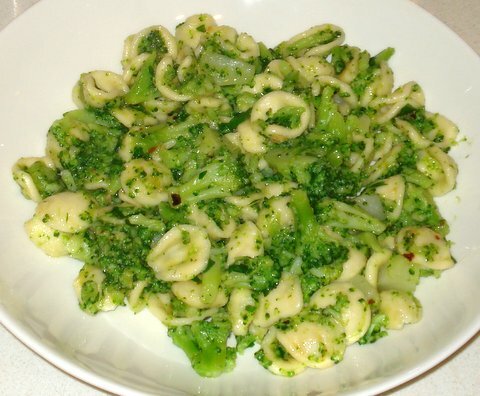 Pasta with broccoli is a primo piatto I prepare on a regular basis. It is quick, tasty, and healthy. Beautiful fish. Not surprisingly, I’ve never heard of it! 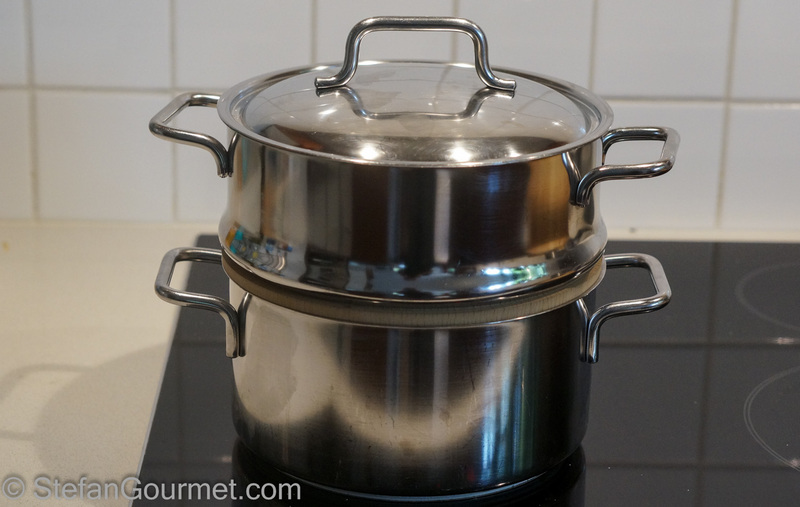 Stephane’s blog is where I learned about wild asparagus as well. It’s so pretty! What a wonderful dish. I love that kind of simplicity where great ingredients are cooked perfectly and don’t need lots of embellishments. Even a Zen Chef has to love Italian food, which I do! You might be aghast at the variations found in Japan, though! I’ve never seen wild asparagus before. Bet they are delicious! Great recipe! Luckily, most people don’t know grey mullet. So, the fish is very reasonably priced. In Germany trout, for example, is more expensive! And it is not overfished yet. A very important point in my opinion. Good point. In Dutch the name “harder” doesn’t sound very inviting, which also keeps the price reasonable. fantastica la pasta con i broccoli. In Italia sono chiamati asparagi prussiani. Asparagi selvatici sono differenti. In Friuli non li ho mai trovati. Farò una ricerca. Very nice, Stefan. I love the simplicity of the dish. I, too, had never heard of wild asparagus. I will see if I can find it here in the US. I am very intrigued by it and definitely want to try it. 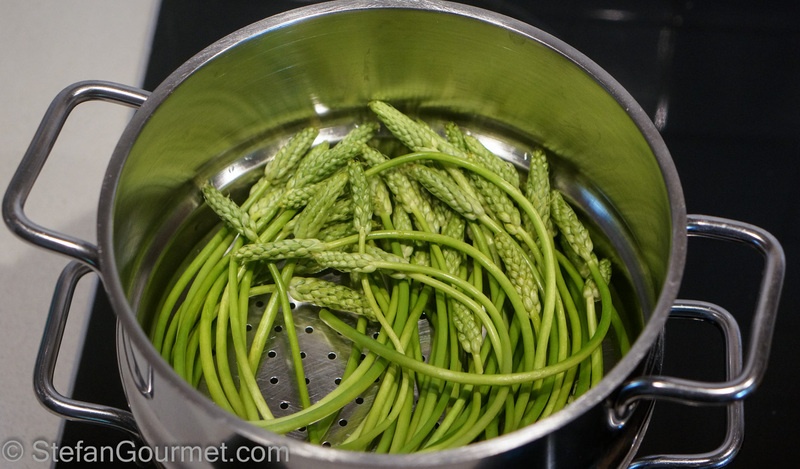 The wild asparagus look really interesting…just need to get my hands on them here in the States…alas, might not be an easy task! What a perfect dish!! Have to do homework both re the asparagus and the fish – the kind of challenge I so enjoy 🙂 ! Great stuff Stefan. As I lie here on the couch, I am cogitating what to do with a whole tuna. I bought it yesterday and will either barbecue it or smoke it if it fits the smoker. Whoa, a whole tuna. Eat the belly (toro) as sashimi 😉 It may be difficult to smoke it without overcooking it. Low and slow on the bbq? Looking forward to what you’ll do with it.